On the very first page of The Big Book of Dashboards, the authors go out of their way to give their readers a warning: "This book is not about the fundamentals of data visualization." I agree. If you're brand new to data visualization, The Big Book of Dashboards is probably not the book for you. Instead you should probably pick up Cole Nussbaumer Knaflic's Storytelling with Data or Alberto Cairo's The Functional Art. Two titles, incidentally, that the authors of the Big Book themselves list in a section where they offer suggestions for great books on data viz basics (they also include titles by Stephen Few and Colin Ware). But let's say you've already read one of those books on data viz fundamentals. Let's say you already know that pie charts are dangerous and bar charts should start at zero. You've gotten the memo on how colour should be used sparingly and chart titles should be descriptive. What then? Well, then you really owe it to yourself to pick up a copy of the Big Book of Dashboards. I've read a number of books on data visualization and the Big Book is one of the best I've come across in that sweet spot between books for beginners and books for experts (or academics). In particular, the book's focus on Dashboards means it has a lot of helpful advice about a topic many books for beginners largely ignore: interactivity. A lot of the fundamental principles of data visualization are focused on how to create static charts. But in the real world, people are increasingly being asked to make interactive Dashboards for their organization, which requires careful thought about things like how filters should behave, where dropdowns should be placed and how to make sure that your users understand how everything works. The Dashboards featured in The Big Book of Dashboards are almost all interactive, and there is a constant discussion throughout the book on how to anticipate your user's needs through careful use of interactivity. The Big Book is broken into three parts. Part 1 is a primer on data visualization basics. This is a pretty good refresher on data visualization principles but, like the authors, if this is what you really need I'd suggest you read another book first. Part 2, by far the largest section of the book, is a series of nearly 30 chapters: each one focused on a different Dashboard that solves a particular real-world problem. Part 3 is a series of essays that cover interesting topics like how to personalize your Dashboards and different ways to visualize time. I found the most enjoyable way to read the book was to read Parts 1 and 3 all the way through first, and then dip into the Dashboards in Part 2 a little bit at a time. Each chapter in Part 2 follows more-or-less the same structure: An image of a Dashboard, a brief description of the real-world scenario the Dashboard is trying to solve, a discussion of how people use the Dashboard and then a discussion of the Dashboard's strengths and weaknesses (including, in some cases, suggestions for alternative ways of visualizing the same data). Not surprisingly, I found I was most interested in those chapters that featured Dashboards on topics that interested me or projects similar to those I've tackled myself as a consultant. I spent a lot of time poring over the chapter on how to visualize student satisfaction surveys, while largely skimming the chapters on sports statistics. That said, as the authors point out, solutions to one problem can often be applied to another (for example, product ratings can be visualized in a similar way to teacher ratings). I suspect other readers will find the same thing I did: You'll be drawn first to the chapters most applicable to your day-to-day work, but will be surprised how, later on, you'll be inspired by examples of data visualization solutions from other subject areas. The nice thing about the way the book is structured is you can make your way through the scenario chapters in pretty much any order you like. It's pretty easy to flip through the chapters to find the ones that interest you the most. But if I had a suggestion for the 2nd edition, I think a "visual Table of Contents" — showing thumbnail sketches of each Dashboard along with the chapter title — would make such skimming even easier. While one of the book's authors (Andy Cotgreave) works at Tableau and the other two (Steve Wexler and Jeffrey Shaffer) are Tableau Zen Masters, the book is platform agnostic: Tableau is barely mentioned. And, yet, I found one of the other major strengths of this book is that pretty much every Dashboard featured can be built using Tableau. Which means the solutions you find in The Big Book of Dashboards are ones you can put to use almost right away in your day-to-day work. I think that could also make the Big Book a great resource for data visualization practitioners to share Dashboard ideas with others in their organization. I suspect many data visualization practitioners live in fear of their boss coming to them one day and asking them to recreate some New York Times masterpiece like the 3D yield curve or floating map of Antarctica. Visualizations that, frankly, can't be built without D3 and some serious coding chops. If you make interactive Dashboards in your day-to-day work, or often have to explain what a Dashboard is to others in your organization, I highly recommend The Big Book of Dashboards. 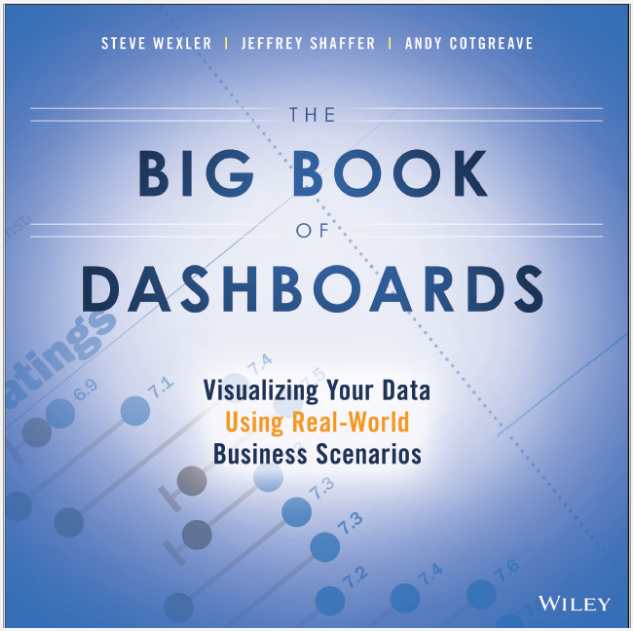 Disclosure: I know all three authors of The Big Book of Dashboards and, even worse, I like and respect all three of them. I also got a brief shout-out in the book for my Tapestry talk on personalizing data viz. And I got a free copy.